Crunchin’ Bones Lamb Meal & Rice with Chicken and Rice Puffed Treats are a light, richly flavored treat that your dog craves! These low fat dog treats are tasty and create a mouth watering aroma that your dog will find irresistible. This barrel of goodness has two flavored bone-shaped treats, which compliment each other in taste. The lamb meal and rice treat contains a satisfying flavor, which greatly compliments the chicken and rice puffed treat. The chicken and rice treat adds the right amount of balance so that both treats compliment each other, which in turn produces a savory taste. 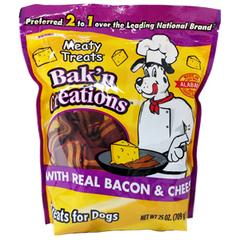 Therefore, this mixture of treats is sure to be a staple rewarding snack for your dog.